Rising up once again from the depths of Norway, ambling like a warp-spasming demon through the debris left from the wake of their 2005 7 inch "Piercing Through", Grotesque Hysterectomy are back to cause severe trauma to the upper torso via their septic brand of filth-ridden Death Metal. Each separate element of the music on offer here stinks of the insalubrious, with the guitar tone sounding like it's been dredged from Satan's own U-bend, the drums and basslines threatening to rattle teeth loose, and Disfigured Chest's vocal work belching as much bile filled sickness per second as ever. All these elements combine sickeningly for a thoroughly enjoyable (if not criminally short) Death Metal album, reminding of the likes of classic Morbid Angel (especially in the title track), Immolation ("Obeyer" and "Exhibitionist" in particular) and just about every other Death Metal band of worth in between. Sure, that obviously means that this isn't original (just how can someone make any metal genre original nowadays anyhow? ), but with that said it still manages to crush with the power of a sledgehammer to the face, track after each fetid track. As a side note, whereas their last 7 inch came with a sick bag, the band have decided to go one better this time on the gimmick front. 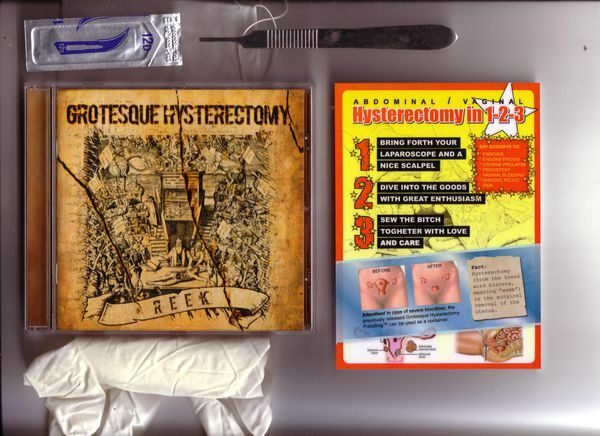 The first hundred copies come with a 'Hysterectomy Pack' featuring a step by step hysterectomy guide, surgical mask, glove and scalpel - essential for the Jack the Rippers among us I'm sure you'll agree(!). Gimmicks aside, Grotesque Hysterectomy have a great old school vibe about them. All being well, with the undeniable relish that these guys put into their Death Metal, "Reek" should see them deservedly pushed into the Death Metal limelight.